As I've said before my boyfriends favourite meal is toad in the hole, so I've probably made it 1000 times. After my last toad in the hole post, I've decided that if I'm going to make it a lot, I want to make it different every time. I don't really like veggie sausages and since cauldron changed their recipe (why!) I can't find any that I actually want to eat. So that's why this came about. 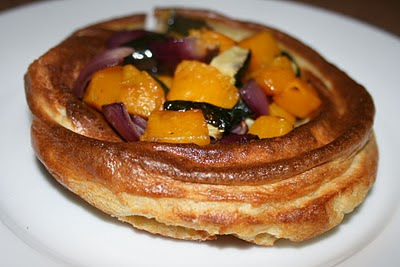 I was thinking about just making a huge Yorkshire pudding, but that would be a bit boring (and maybe a bit weird) so I filled it with some lovely autumnal roasted veggies. 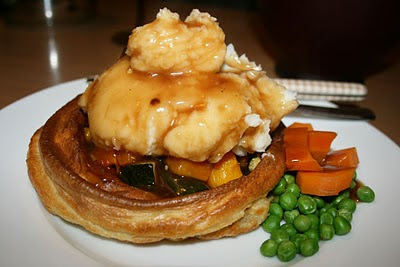 It's perfect for this time of year because it's nice and comforting and full of flavour. Preheat the oven to 200 degrees, then peel the squash and onion and chop all the vegetables into large chunks. 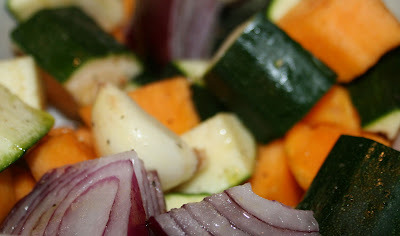 Pop the vegetables and garlic cloves into a roasting tray, cover with some olive oil, season well and pop in the oven. Put 4 tbsp of olive oil into each round tin and put them in the oven. While the vegetables are roasting, make the batter by whisking together the egg, flour and milk until it's a lovely thick batter. By the time the Yorkshire's ready the veg should be roasted, so all you need to do is remove the garlic, serve it up and enjoy! It's great with a big dollop of mash and gravy on top and would also be good if you ever have any veggies coming round for Sunday roast!